Many women who are pregnant complain about hip pains at night. Pregnancy has some sleeping disorders which each require special attention. Since sleeping on the back during pregnancy is not recommended, and sleeping on the stomach during the second and third trimesters is uncomfortable, many women begin to sleep on the side during the second and third trimesters. There are some solutions which can relief hip pains for pregnant women. Please consult your doctor for personal medical advice regarding your condition. Sleeping on the left side during the third trimester is safer for the baby, and also for the pregnant mom. Left side sleeping allows better blood flow to the baby and to the lower legs, so it minimizes the varicose veins and vaginal veins during the last trimester. But SOS (Sleep On Side) has its own side effect which is hip pains during the night for pregnant women. The hip pains are caused because the pregnant body produces more progesterone hormone which relaxes the body tissue allowing it to expand and transform. The hip joints loosen during pregnancy, so the lower abdominal can expand and be prepared for the delivery. When sleeping on sides the crossed legs press out the loose hip joints, causing pregnancy hip pains during the night. The pressure can be so intense some women feel the painful hips even a day after, and for some it hurts even to walk. The Health Hype website mentions more reasons for the troubling pregnancy hip pains. You can learn how to relieve these condition further below. Pregnancy hormones, such as relaxin, help to relax the joints of the pelvis by relaxing the muscles and ligaments around the joint, so as to facilitate easy delivery of the baby through the birth canal. Excessive relaxation, however, may weaken the joints and result in pain. Although relaxin works mainly on the pelvic joints, it does have some effect on the other joints as well. This can cause more stress on the joints, particularly those related to weight-bearing. Changes in body weight distribution and posture as a result of carrying the weight of the growing fetus will also contribute to joint pain. Swelling caused by fluid retention in pregnancy may lead to conditions like carpal tunnel syndrome. Deficiencies of nutrients, especially of DHA or docosahexaenoic acid (an essential fatty acid present abundantly in fish such as tuna and salmon, which helps in lubrication of the joints) can be a cause of joint pain during and after pregnancy. Read more.. The following hip pains solutions support the pregnant body, pregnancy sleeping and the hip joint strength. Pregnancy pillows are recommended during pregnancy because the pregnant body has different curves which requires better support. 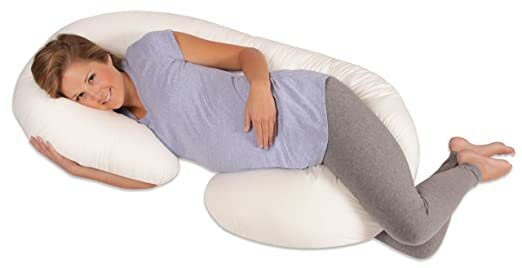 Full body pregnancy pillows are long thick pillows which can be placed between the knees. When the knees are parallel at night and the ankles are not crossed the pressure on the hip joints is reduced. Thousands of women use pregnancy pillows to support left side sleeping positions. If you take a look at the picture on the right, you will see the Snoogle Total Body Pillow. The full body pillow supports the knees, keeping them slightly apart and parallel all night. When the knees are parallel the pressure on the hips is relieved, and the hip pains are reduced. This solution is effective and also not expensive, most pillows cost less than $100, and are worth the pain-free nights. The second solution many women have found to totally solve their hip pains during their pregnancy nights, is the 4 Inch Memory Foam Mattress Pad Bed Topper. The thick memory foam mattress absorbs the weight of the body and spreads it over larger foam areas, by this reducing ‘the body weight’ at any specific point. There are also thin memory foam mattresses which are only 2-3 inch thick, the thin toppers are slighly cheaper but most pregnant women who reported a dramatic relief in their hip pain condition said they used the 4 inch mattress topper. You can pick your exact bed size when you order the 4 Inch Memory Foam Mattress Pad Bed Topper. DHA is docosahexaenoic acid which is an important nutrient for pregnant women. The main source for DHA supplements is sea fish like Salmon, tuna, herring and sardines. The Omega-3 fat is valuable for the baby development as well as for the mother’s well being. The DHA is a fatty acid which lubricates the hip joints (and other body joints – ankles, knees and wrists). Without the DHA the pregnant women’s hip joints become stiff and rough and the pressure placed by the crossed ankles at night or the constant pressure on the mattress cause them to hurt. How much DHA should be enough to relief pregnancy hip pains? There is no official DHA supplement recommendation but various studies have been made. A recent study by the Journal of Perinatal Medicine said pregnant women need 200 mg of DHA a day. Here are highly rated DHA supplements. Unlike other pregnancy conditions the hip pains can be treated and managed by changing the pregnancy diet and adding DHA to the daily nutrition, changing the pregnancy sleeping position by adding a pillow between the legs and sleeping on a mattress which supports the body. Other women might be suffering from pregnancy hip pains just like you, you can help them by sharing this post. So before you leave this page, please share it with your Facebook friends. This entry was posted in Happy Pregnancy, Pregnancy Beauty, Pregnancy Fitness, Pregnancy Symptoms and tagged hip pains during pregnancy, How To Relief Hip Pains During Pregnancy, pregnancy hip pains in the third trimester, pregnancy hip pains relief, pregnancy hip pains while sleeping by admin. Bookmark the permalink.